Artist impression of the Kuala Lumpur International Financial District. The Kuala Lumpur International Financial District (KLIFD) is a key enabler to strengthen the position of Kuala Lumpur as the global financial city of choice, transforming Kuala Lumpur into an international hub for banking and finance as well as related professional services. KLIFD has been identified by the Government as an Early Entry Point in its comprehensive Economic Transformation Programme to more than double per capita income by 2020. The Government wholly owns 1Malaysia Development Bhd (1MDB), the master developer for KLIFD. The RM26bil project is located in the heart of Kuala Lumpur’s southern tip. It sits on 75 acres encompassed by Jalan Tun Razak, Jalan Sultan Ismail and the Putrajaya elevated highway. It will be overseen by 11 local and foreign consultants appointed by 1MBD to push forth its development. The infrastructure engineering consultants are EDP Consulting Group Sdn Bhd and Buro Happold Consulting Engineers, a UK and US consultant which also acts as KLIFD’s sustainability consultant. Others include security and risk engineers ARUP Jururunding Sdn Bhd (from Malaysia) and Hong Kong-based ARUP Group International. A consultant from Qatar, KEO International Consultants, has been selected as programme management adviser. The appointments are in addition to the two master planners, Akitek Jururancang Malaysia Sdn Bhd and Machado Silvetti & Associates, recently selected from an international design competition. 1MDB owns the 30.35ha on which the KLIFD will be developed. The entire financial district is slated to be completed in two decades, with its first phase operational by 2016. Under Budget 2012, to accelerate the development of the KLIFD, the Government will offer income tax exemption of 100% for a period of 10 years. Also, property developers in KLIFD will benefit from income tax exemption of 70% for a period of five years. A view of KLCC in the vicinity of the Petronas Twin Towers. 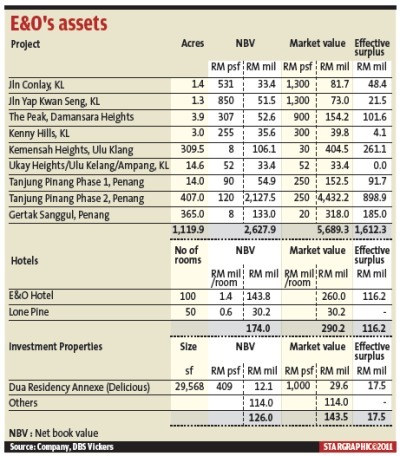 PRICES of luxury high-rise residential properties primarily within the Kuala Lumpur City Centre (KLCC) and Mont'Kiara areas are likely to remain soft to flat in 2012, say experts. James Goh of Savills Rahim & Co says he expects rental prices within the KLCC area to remain flat going forward, with some even dropping, owing to the cautious economic outlook. “We believe owners will be more realistic (with their selling prices) and be pressured to sell,” he tells StarBizWeek. On rental prices within the KLCC area, Goh says there were “several categories”, depending on the property. “There are some that range from RM750 per sq ft to RM950 per sq ft and others that range from RM1,100 to RM1,300 per sq ft. Then there's (Bandar Raya Developments Bhd's) The Troika, which is in a class of its own,” he says. Goh says he expects prices of high rise properties within the Mont'Kiara area to remain flat next year, just like the KLCC area. “The KLCC area offers a lot of opportunities (for potential investors),” he says, adding that Savills was currently conducting a tender of 61 luxury units from a selection of luxury apartments in Kuala Lumpur. A property analyst says he expects the high-end residential market to be soft next year. Rahim & Co head of research Saleha Yusoff says market activity within the KLCC area has been less active in the secondary market with prices expected to remain stable, ranging between RM800 and RM2,000 per sq ft, going forward. Saleha says the asking price for property within the KLCC area is currently ranging between RM730 and RM1,400 per sq ft. Not to far away, in the U-Thant area, commonly known as Embassy Row, prices range from RM750-RM1,300 per sq ft. In Mont'Kiara, prices have soften a bit and today is priced from RM590-RM860 per sq ft. According to the Property Market Report 2011 by C.H. Williams Talhar & Wong, prices of luxury condominiums in the Klang Valley have increased better than moderate over the past year with the biggest threat to price stability being supply. “A significant new supply of luxury condominium units are anticipated to be added to the current market over the next three years. Further supply can be expected with a number of approved projects. There is also ample supply of land for future condominium projects. “Thus, the supply situation is anticipated to create further pressure on occupancy rate and rentals upon completion. As most of the luxury condominiums launched earlier have achieved good take-up rates, the risk is with future launches,” it says. Going forward, the report said the luxury condominium market is expected to be stable to soft. On the serviced apartments sub-sector, CH Williams Talhar & Wong says this sub-segment is popular with guests on business or leisure in the KLCC area and is expected to remain attractive due to their strategic locations. “Healthy gross domestic product growth, increasing tourist arrivals and the Government's effort to attract multinational companies into the country is expected to spur demand for serviced apartments. Although hotel-type serviced apartments recorded stable occupancy and average room rates, continuing competition and “rate undercutting” among serviced apartment and hotel operators which offer “apartment studio units” are expected to intensify. The C.H. Williams Talhar & Wong property report says the total supply of luxury condominiums in Kuala Lumpur stood at 84 developments with a total of about 10,323 units as at the end of last year. Six developments were completed in 2010 with a total of 705 units. These included the completion of 2 new developments; D9 Bangsar (nine units) and Suasana Bangsar (190 units) which are expected to be handed over to owners early this year. The average occupancy rate for existing luxury condominiums in the KLCC area has indicated a slight decline last year due to sluggish demand. Most of the newly launched luxury condominiums with a larger proportion of smaller units showed good sales rates of about 90% within the first 12 months of launch where as most of the unsold units tend to the bigger ones. In Bangsar, Damansara Heights and Mont'Kiara/Sri Hartamas, the transacted prices of luxury condominiums ranged from RM620-RM850 per sq ft, RM500-RM700 per sq ft and RM500-RM780 per sq ft respectively in the secondary market. The asking rentals of luxury condominiums in KLCC area ranged between RM4 and RM5.50 per sq ft. Current yields for luxury condominiums in Kuala Lumpur City Centre generally range between 6.0% and 6.5%, said the report. Meanwhile, the total cumulative supply of serviced apartments in Kuala Lumpur stood at 49 developments with a total of about 11,709 units as at the end of last year, says C.H. Williams Talhar & Wong. New supply of serviced apartment developments completed by end-2010 included Park Royal Serviced Suites (One Residency- South Tower) and MyHabitat located off Jalan Tun Razak, Sommerset Ampang in Ampang Hilir/U-Thant area and Gateway Kiaramas in Mont'Kiara. These added about 1,046 units to the total existing supply which will exert some pressure on overall occupancy rates for the serviced apartment sector this year. In the next three years, a total of 7,352 serviced apartment units in 21 developments are expected to be completed, increasing total supply of serviced apartments to 19,016 units by end of 2013. Developer's selling prices for serviced apartments launched last year ranged between RM800 to RM1,400 per sq ft and these serviced apartment developments showed a relatively good sale rate of 70% to 90%. The overall occupancy rate for serviced residences and hotel-type serviced apartments dropped as it faced pressure from the large incoming supply. The average occupancy rate for the existing serviced residences declined from 70.7% in year 2009 to 64.6% 2010 while the average occupancy rate for hotel-type serviced apartments dropped to 70.6% in 2010 from 73% in 2009. The commercial sector outlook is expected to be challenging with supply exceeding demand, property consultants and analysts say. Property services group CB Richard Ellis (M) Sdn Bhd's second quarter research report says the Kuala Lumpur office sector will continue to be challenging in the coming quarters. The amount of new supply over the course of the next five years is expected to increase the city centre's current supply by a quarter, adding further pressure to this segment of the property market. “Rentals are not likely to see significant iincrease in the near term due to a series of upcoming completions (which will add to the supply). However, on the demand side, we are seeing a high level of absorption as a result of upgrading or expansion, particularly in the oil and gas sector,” it says. The report says this will, to some extent, stabilise a potentially weakening market. Moreover, it says the Government's initiatives to further lift Kuala Lumpur's position as a global city and its aim under the Economic Transformation Programme to attract 100 multinational companies to set up their regional headquarters in the city by 2020 would ease some of this pressures. During second quarter 2011, it says only one office building was completed. Located on Jalan Perak in the KL Golden Triangle, Menara Bank Islam offers a total of 355,000 sq ft of net lettable area. “Average gross asking rents for existing Grade A space are still flat, with the majority of existing buildings in the RM6 to RM7 per sq ft range. A few city centre buildings, such as Vista Tower, Menara Dion and Menara IMC, have gross asking rents of RM8 per sq ft or higher, while Petronas Twin Tower 2 and Menara Maxis are in the RM10 per sq ft range and above,” CBRE says. Given the quantity of office supply projected to complete during the next two years, it is unlikely the majority of landlords will have any significant leverage to raise rents. 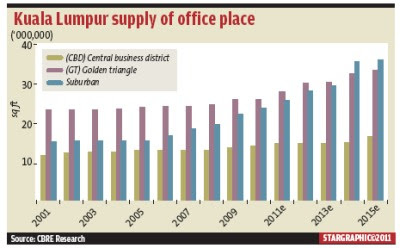 The total supply of office space in the Klang Valley stood at 80.9 million sq ft as of the second quarter, up from 80 million sq ft in the first quarter. “Rentals have generally remained static in second quarter with average gross asking rents for selected prime buildings in the Kuala Lumpur City Centre (KLCC) at RM7.18 per sq ft,” it says. The market is aware of the supply-side risk and expects a large quantum of new office supply to come online over the course of the next few quarters, which may further pressure office rentals to trend downwards. The KLCC office market expects to see an additional supply of 2.35 million sq ft and 1.9 million sq ft in the second half this year and 2012 respectively. This location will also face competition from suburban areas where about 1.7 million sq ft of office space is due to be completed within the next six months. “Concerns remain about the impending supply, but the first impact of this should not be felt until later this year or early 2012 when buildings such as Menara 3 Petronas, Menara Binjai and Menara Worldwide are completed,” it says. Consultancy CH Williams Talhar & Wong Sdn Bhd (WTW), in its Property Market Outlook report for the second half of this year, says the Klang Valley office sector remains a tenant's market with a large amount of space available for leasing. The WTW report points out that landlords of newly-completed buildings continue to offer two to three months free rental to attract tenants. “Recently constructed or refurbished office buildings are securing new leasings at a much slower rate. There are also office buildings along Jalan Tun Razak which have remained largely untenanted for more than two years since their completion in 2008 and 2009,” it says. In the first half of this year, purpose-built office space in KLCA (Kuala Lumpur Central Area) accounted for 40.1 million sq ft. About 6 million sq ft will be completed by the end of 2014. Of this, about 4 million sq ft in nine buildings will be located in the golden triangle. WTW managing director Foo Gee Jen is reported to have said that while there were no new developments completed in the first quarter of this year, over 3 million sq ft of new office space will come online by the end of this year. HwangDBS Investment Management Bhd head of equities Gan Eng Peng says rental yields are falling, while vacancy rates and debt costs are rising. Coupled with tighter regulations to curb speculation, the commercial property cycle has peaked (for the time being). “Drive around the usual Klang Valley hot spots such as KLCC, Solaris Dutamas, Solaris Mon't Kiara, Bangsar, Kota Damansara and Damansara Perdana and you can see many unoccupied units,” he says. He adds that given the current skyhigh prices, it is wiser to wait till the dust settles before investing in properties, especially business units. “This is due to the large supply and murky economic outlook as a result of a mixed set of data from the US economic growth, emerging markets' inflationary concerns and Europe's sovereign debt fiasco,” Gan says. It says tenant-favoured market sentiment will continue to prevail and rental levels in general, may remain flat or decline slightly while the office take-up rate in existing buildings is expected to remain modest in the year ahead. The signs of the times are here, and they are not unique to Malaysia. The concerns about the global economy are real. Whether one is an avid property watcher or a young person considering a downpayment on one's first home, there are certain things to take into account. Analysts have downgraded the property sector or had a negative outlook on it after they noted that average take-up rates of launches by property developers dropped from 80%-90% a year ago to a forecast 50%-65% in the second half of this year. To understand what is going on in our current property market and to get some pointers about its future direction, we need to look back a little. When property prices began to inch upwards in the second half of 2009, in the wake of the fall of Lehman Brothers in September 2008, there was cheer all round. But as prices continue to escalate into the first half of 2010 and then the second half, property watchers and buyers began to take note of the ballooning values in the landed property sector. The momentum shifted to high-rise, although to a lesser degree. In response, developers fast-tracked their launch programmes. Some were quick enough to launch products in the second half of 2010, while many of the rest were able to do so this year. This situation of “buying before price goes up further” is evident not only in the Klang Valley but was especially so on Penang island. It was this frenzy of buying in selected locations that fed the worries about a bubble, coupled with the easy credit and low interest-rate regime. This double whammy of easy credit and low interest was not just evident in Malaysia. It has also played out in China, Singapore and other countries in the region. What is interesting is that the United States has gone through this situation a couple of times. It worked and the US economy flourished. Inflation inched up and as it did so, workers demanded wage increases to keep up with higher prices, companies raised prices to compensate for the rising wages, and it became an upward spiral. Recession was the only thing that can break the cycle, and it came in the mid-1980s. That, both Fernandez and Chan agrees, is what is happening in the United States and then Europe today. 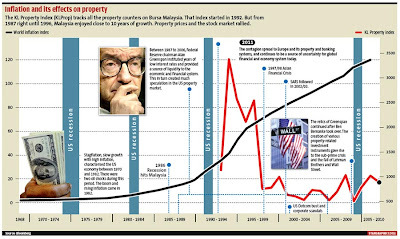 In the 1990s, the then US Fed chief Alan Greenspan also kept interest rates too low for too long, which led to a speculative bubble in real estate. “We are ignoring the dangers of the twin combination of easy credit-low interest and a speculative property market,” warns Fernandez. He says although the property market has some distinctive factors, like any other market, it still runs on demand and supply and underlying fundamentals. “Because it is a market that has no shorting mechanism, it has a tendecy to rise rather than fall, unless the fundamentals pulling it down are strong,” Fernandez points out. In Malaysia, this enchantment with properties the last two years has intensified because of a lack of alternative investment options, the availability of easy credit and as an hedge against inflation. The government moves are a factor as well. Last year, the Government announced seven mega development projects to spur the economy. 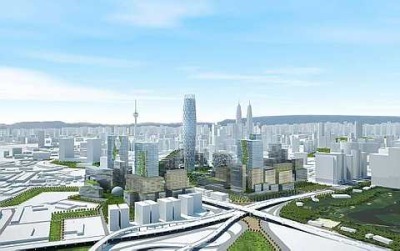 Two of these were mentioned in Budget 2012 the development of government-owned land around Sungai Buloh and the KL International Financial District (KLIFD). Both are expected to take off in the second half of next year. The Government has invited some developers to participate. The finance sector has also profited from the property boom, with property loans being the main driver of growth for the banking industry, accounting for 40.6% of the overall credit expansion. The residential segment accounted for 27% of total loans. Analysts expect property loans to remain the key driver of credit expansion this year and in the near future. Although there was a slowdown in loan applications for residential mortgages after the implementation of the 70% loan-to-value cap on the third and subsequent house financing, the momentum has picked up again since March. The demand for property is driven by many factors. In today's prevailing uncertainty, demand is driven by job security, sentiment and affordability, says Tan Sri Leong Hoy Kum, managing director and group chief executive of developer Mah Sing Group Bhd. “We have a relatively young population, which means there will be a demand for starter homes. Whether for landed units or condominiums, the demand for larger units and high-end housing will definitely be slow. So we are changing our strategy,” he adds. “Instead of concentrating on high-end housing, we will do mid- to high-end on fast-turnaround basis. We will launch three to nine months from the day we buy the land. If semi-detached units, it will be RM1.4mil and below. If it is a landed strata, it will be priced lower, and if it is high-rise, the built-up area will be smaller. Our focus will be on affordability. About two weeks ago, Mah Sing announced that it has purchased 90ha in Rawang. The move to less-prime locations will be another strategy to aid affordability and to overcome land scarcity in the popular areas. The company is the second top developer to recently signal this move to less-prime locations. SP Setia Bhd is the other; it bought 673 acres in Rinching, located mid-way between Semenyih and the Bangi old town. As the woes in Europe and United States cast a pall over global economy, what will be ahead for locations around the iconic Petronas Twin Towers in the Kuala Lumpur City Centre, often regarded as the pinnacle of Malaysian property? Henry Butcher Marketing Sdn Bhd chief operating officer Tang Chee Meng says developers have noted the signs of an imminent slowing of the market. “Developers are today revamping their sizes. They are taking their projects to Singapore, China and Britain to sell. Or they work with banks to provide innovate mortgage packages. Some developers are also having friend-bring-friend commission in order to move sales. In a buoyant market, this will not happen. The larger units completed a couple of years ago in the KLCC market may continue to remain vacant with pressure on rentals. “The European woes are weighing on investors. In that sense, the market is correcting itself. Developers may say these external global situations do not impact us. But there are many discerning people out there and they take note of what is going on in the US and in Europe,” says Tang. A real estate agent specialising in properties in Mont'Kiara, another location that is closely watched, says the Sunrise MK28 has reduced its original price of about RM680 to RM700 per sq ft to RM590 to RM600 per sq ft. In Desa ParkCity, where prices of landed units have gone up by as much 300% or even more, the larger units of some of its latest launches are still available. 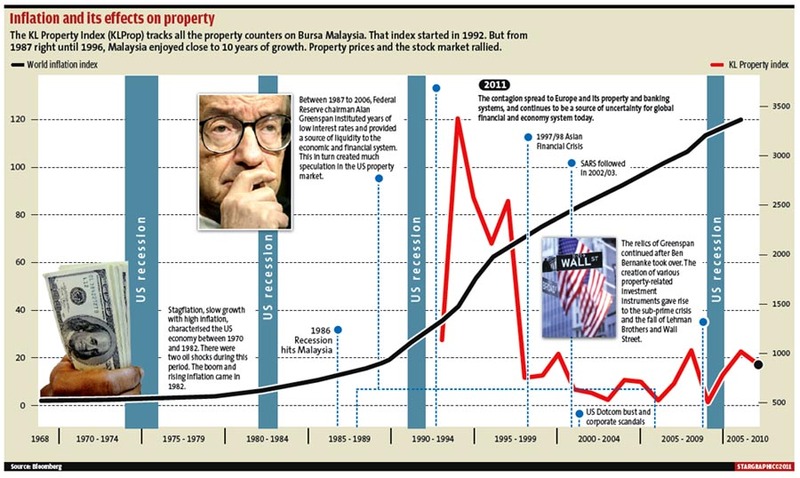 About a decade ago, especially when the interest in KLCC-Petronas Twin Towers began, and in tandem with the proliferation of high-end landed and high-rise residentials, developers and property professionals took great pride comparing property prices in Malaysia with regional countries and concluded that the prices of Malaysian properties were far below those of China, Hong Kong, Singapore and Thailand. Projects around the Petronas Twin Towers were compared with London's Hyde Park and New York's Central Park. Today, such comparison continues to be made. Says Fernandez: “This comparison has not stood the test of time. This suggests that our properties are not open to such comparisons and that such comparisons are not an appropriate measure. The drop in prices of between 20% and 25% soon after the 2008 crisis show that the market is mainly driven by our own governing fundamentals. Which is another sign of the times we are living in today. “The global environment is changing. Strictly speaking, an upgrader sells the old house to buy the new. If he is going to hang on to the old, he will have to consider the rental market where yields are falling. He has to consider whether the market has peaked in the areas he wants to buy and whether it can go further and that may be unlikely in many areas. Value has gone above the normal governing fundamentals of price versus household income, and price versus rental returns. “Although Malaysia is rapidly developing and we have a young population and we have seen more years of prices running up than going down, this may not be replicated as sentiments may be poor as a result of what is happening in Europe. “As for commercial properties, the retail market looks stronger than the office market as there is an oversupply in this sub-segment. “Prices will have to stabilise. When considering buying the larger residential units for investment, the question to ask is, Can you rent it out? Smaller units will be more feasible. But having said that, we are seeing a huge number of 400 sq ft units of service apartments being built. While these may be affordable, buyers must consider rentability. Access, connectivity and proximity to amenities are important. And if there are so many of these units, you may need to take a longer period to rent and to re-sell in the secondary market in today's uncertain climate. “Demand for landed units on the mainland and Penang island will continue but yield on the island is expected to be low, at 1% or 2%. The price movement for this year has been greater than last year. We continue to see land prices going up. For the lower to mid-end, prices are still moving. Demand is expected to remain firm for properties priced RM600,000-RM700,000 and below. For those between RM800 and RM1,000 per sq ft or about RM1mil, people will have adopted a wait-and-see attitude. RISING price pressures amid a low or no growth environment is bound to cause worries among many quarters. This seems to be the situation faced by many countries in different continents of the world today. From Europe to the Middle East and Asia, much of the world is still embroiled in this unenviable situation. During such times, more affirmative actions and policies need to be undertaken by governments to help the people tide over the difficult and challenging times. And these should include long-term policies that address livelihood issues such as the high cost of living and its inverse effect on the people's standard and quality of living in general. Rising prices are evident in the property market. In less than a decade, especially in the last two years, property prices have shot up a number of folds to levels that are out of the reach of the common people. In Hong Kong, the high housing and rental costs brought tens of thousands of demonstrators to march in the streets on July 1. Many common folks are still caught in a quandary as the steep housing prices and rising cost of living have caused much worry and discontent. This is further exacerbated by the gloomy global economic outlook that shows the much-feared second dip is quite likely to happen. The road ahead will get even more daunting before things get any better. It is no wonder that public housing is fast becoming an important social agenda needing urgent government attention if societies are to continue to be functional and sustainable. It is encouraging to note that the Malaysian Government is looking into providing more affordable and medium-cost public housing to cater to the needs of the people. To ensure this noble measure gets off on the right footing, it should be planned based on a long-term and holistic approach. But it should not take too long as the country's public housing policy is in a state of disarray and in need of an urgent overhaul if it is to serve the needy. If well planned and executed, the affordable-housing and public housing schemes will turn out to be among the best efforts in improving the quality of life and encouraging home ownership among the middle- and lower-income groups. While pricing the property affordably is one of the main objectives of the public housing initiative, there should not be any compromise on the quality of these projects. It is also vital to ensure that these projects are accessible to good public transportation facilities and are close to public amenities like local grocer, convenient stores, and medical and education facilities. The lower-income group is most dependant on these amenities to improve their standard of living. The implementation of the selling process has to be transparent and fair to ensure the projects will benefit all deserving and needy Malaysians. The decision to raise the limit of house prices under the My First Home Scheme from RM220,000 to RM400,000 beginning January 2012 has brought some cheers as it will give more young people wider choices of property to choose from. In view of the rising house prices in the urban areas, it will widen the opportunity for first-time home owners to buy bigger and better houses. Despite the higher price margin, buyers should know their limitations and should refrain from committing carelessly. Buying a more expensive unit will mean they will have to commit to higher mortgage loan which will lower their household disposable income. To keep the frothy property market in check and rein in price hikes, more impactful measures need to be implemented. One of the effective ways to nip speculative buying in the bud is to tighten the mortgage loan requirement and to discontinue the easy housing packages . The relatively easy credit facilities provided by the banking sector will mean that property prices look set to remain on their upward trend in the near term. Banks should be reminded of their duty to help to promote a balanced and sustainable property market, and should not give out loans easily if home prices shoot up artificially. Meanwhile, developers should look into building more value into their projects rather than merely hyping up the concepts and designs. During challenging times, it is meaningful to go back to the basics of having simple but practical and occupant-friendly designs, while some of the frills can be provided as options to lower the property price. Developers should look into more practical and functional designs and layouts, such as offering houses with bigger floor space. That way, two generations from the same family can be the joint owners to share out the cost. Although they may be living under the same roof, the design of the house will ensure privacy and individual space for the inhabitants. This is also one practical way of keeping our traditional “extended family” practice alive. Deputy news editor Angie Ng believes having empathy and a willingness to provide for those left behind will promote greater understanding and harmony in our society. Gadang's managing director and chief executive officer says the company is bidding for contracts worth about RM1.5 billion. 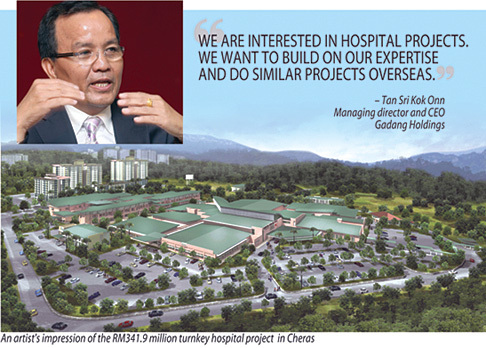 Kuala Lumpur: Gadang Holdings Bhd is beefing up its construction activities and eyeing several contracts under the Economic Transformation Programme (ETP) including hospital projects to improve earnings. Managing director and chief executive officer Tan Sri Kok Onn said the company is bidding for contracts worth about RM1.5 billion. "We are interested in working on hospital projects. We want to build on our expertise and hopefully, do similar projects overseas," he told Business Times in an interview recently. In 2008, Gadang's unit, Gadang Engineering (M) Sdn Bhd (GESB), won a RM341.9 million turnkey contract for the Rehabilitation Hospital (formerly, Lady Templer) in Cheras, Kuala Lumpur. Just this week, GESB won a RM411 million contract from the Public Works Department to complete the abandoned 300-bed Shah Alam Hospital. The Shah Alam hospital project was mooted some 12 years ago at a cost of RM300 million to ease overcrowding in the nearest government hospital for Shah Alam residents, the Tengku Ampuan Rahimah Hospital in Klang. The project was sub-contracted to GM Healthcare Sdn Bhd by its then main contractor, Sunshine Fleet Sdn Bhd in 2007, when its first sub-contractor, Isyoda Corp Bhd, withdrew from the project. Sunshine Fleet is owned by Selangor princess Tengku Putri Arafiah Sultan Abd Aziz Shah and it won the contract via direct negotiations in 2007 for RM482 million. The project, expected to be completed in 2009, was stalled after GM Healthcare filed a lawsuit against Sunshine Fleet for failing to pay the company. The works ministry revoked Sunshine Fleet's contract and called for a new tender exercise in July last year to identify a "white knight" for the job. Six companies were shortlisted, including Gadang, IJM Corp Bhd, Fajar Baru Capital Bhd, Limbungan Setia, Ahmad Zaki Resources Bhd and Gamuda Bhd. Meanwhile, among the contracts Gadang is bidding for is the Sungai Buloh-Kajang line of the Mass Rapid Transit project. Kok Onn said GESB had been pre-qualified in all of the three open categories for the MRT. He said Gadang will tender for several works, including elevated civil works and elevated stations with five packages each, and construction of a depot. 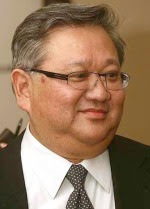 For the year ended May 31 2011, Gadang posted revenues of RM348 million and a net loss of RM4.2 million. The loss was mainly due to non-recurring write-off of bad debt, amounting to RM9.45 million in the engineering division. Gadang's profitability was also stifled by costlier building materials. If you were looking to invest in property somewhere outside Malaysia, where would you go? First, let us set some parameters. We are not looking for something in the mega rich category but it must be located in a decent neighbourhood and within the city limits. Taking into consideration all these conditions, how much would it cost you? How much can you rent it out for, and what would be the rate of return? For the benefit of our discussion, let us look at cities closer to home our Asean neighbours. Singapore would spring to mind as the most expensive city in South-East Asia, followed perhaps by Bangkok and Jakarta, even Kuala Lumpur. But are our assumptions accurate? They are, but only to a point. A quick look at the Global Property Guide, which is available on the Internet, has yielded some interesting numbers. For the sake of consistency, the prices and rentals quoted are for an apartment of 120 square metres located within the city limits. However, they are not likely to be premium properties. According to the guide, the most expensive place in South-East Asia to invest in is Singapore. The city state also makes the No. 5 spot on the world's most expensive property list, ahead of Tokyo that only makes the No. 7 spot. Going by the numbers contained in the Global Property Guide, the average market price of property in the city state is US$16,727 (RM52,555) per sq m. For an apartment of 120 sq m, you will have to fork out just over US$2mil (RM6.28mil). From here on, our original assumption proves inaccurate. Phnom Penh, the capital of Cambodia, it turns out, is more expensive than Jakarta or Manila. It makes the No. 2 spot in the South-East Asia list of the most expensive cities. In Phnom Penh, real estate can cost as much as US$3,750 (RM11,782) per sq m. That means our apartment could cost about US$450,000 (RM1.4mil). Phnom Penh makes the global list of most expensive cities at No. 44, just ahead of Auckland, New Zealand. The third most expensive city in South-East Asia, among the six covered by the Global Property Guide, is Bangkok, a city of 11 million people currently threatened by widespread floods in the north, northeast and central plains of Thailand. Property in this city goes for an average of US$3,300 (RM10,362) per sq m, so a 120 sq m apartment will set us back US$396,000 (RM1.24mil). Bangkok is at No. 48 on the global list, just behind Cape Town in South Africa. Metro Manila makes the South-East Asia list at No. 4. The average price of real estate in the Philippine capital is US$2,407 (RM7,558) per sq m. So our apartment there will cost us US$288,840 (RM906,973). Manila is at No. 64 on the global list. Jakarta, the Indonesian capital, and the most populous city in the archipelago, is the fifth most expensive city in South-East Asia. Property in this city goes for an average of US$1,781 (RM5,592) per sq m. That means a 120 sq m apartment will cost US$213,720 (RM671,092). Jakarta is No. 77 on the world expensive cities list. Bringing up the rear in the South-East Asia list is Kuala Lumpur. The Global Property Guide estimates that the average price of property in this city is US$1,546 (RM4,854) per sq m. Our apartment will therefore cost US$185,520 (RM582,543). This puts Kuala Lumpur at No. 81 on the global list. After making these investments, how much yield can one expect? According to the guide again, Jakarta is the city that is most friendly to property investors one can charge up to US$1,819 (RM5,711) a month to rent out the apartment, thus offering a gross rental yield of 10.21%. This also makes it the third most profitable city in the world in terms of rental returns. Metro Manila is No. 2 on the South-East Asia list in terms of yield. Here, our apartment can be rented out for US$1,836 (RM5,765), thus offering a yield of 7.63%. The rental rate is higher than in Jakarta, but the investment is also much higher, hence the returns are not as good as in the Indonesian capital. Manila is No. 11 on the global list. In Kuala Lumpur, our apartment can fetch a rental of US$1,072 (RM3,366) a month, thus giving us a return of 6.93%, putting the city at No. 3 in the South-East Asia list and No. 22 on the global list. Bangkok comes in next with a yield of 6.49% followed by Phnom Penh with a 3.26% yield and finally Singapore with a return of 2.94%. On the global list, Bangkok is at No. 25, Phnom Penh at No. 73 and Singapore at No. 77. Of course, it is most advisable to be cautious when investing. These examples are not meant to be an advisory on where is best to invest in property. This is merely meant to show that data such as this can throw up some surprises which, all the more, emphasise the need for more research and professional advice when one is considering such investments. So, before you catch the next flight to Jakarta or Manila, talk to your investment advisor first. When the Kuala Lumpur International Financial District (KLIFD) was announced, I was quite pleased at its location at the other end of Bukit Bintang as that part of the city was long the purview of dilapidated civil service residences which degenerated to car wash premises and some unsavoury practices on premises built nearly 100 years ago. All that is a memory now as the land is finally cleared and a new master plan began to emerge. Kuala Lumpur is sorely in need of a financial district such as Connaught Place in Hong Kong or Raffles Place in Singapore or even Canary Wharf in London, a location that every international financial institution would have to be in to be counted as a world leader. The KLCC location could have been ideal but Petronas is not property centric and preferred to surround itself with the oil and gas services industry. There are still a number of vacant sites after 15 years. Malaysia has now a worldwide reputation as a sukuk platform and a halal platform both valuable commodities if you want to do business in the Middle East and be in the running for a syariah compliant financial service. Or if you want to sell your food products to the Middle East. With the tsunami of change in North Africa and the continued instability in that region for some time, more and more banks and funds will want to relocate to safer locations and it's Malaysia and not Singapore or Hong Kong that will be the first port of call if we have the right product and the right location. But after that announcement and the setting up of a great office and hiring people in 2009, there was a long period of silence. In the current gossip-laden environment there was not a peep from the company in explaining anything. Then suddenly after a long lull the KLIFD project is in the news again, with a slew of appointments being made recently for the RM26 billion development. To be fair, from the beginning its master developer 1MDB has made it clear it would let action speak louder than words. But in doing so it had had to resolve issues raised by several parties, transparency being one of the major ones. Now though, more pieces are being put together and the picture is beginning to get a little clearer. For a project of that scale, it is understandable that many will want to have a piece of the action and concerns of fairness when it comes to awarding contracts are bound to arise. From the outside looking in, some may say that not much effort has been done to allay these concerns and curiosity. But it could also be said that 1MDB maintained its own pace in conducting the selection process. The company certainly remains either unaware or impervious, which is necessary for a project like this. Given the 20-year timeline of the project, wouldn't any developer want to ensure all its vendors have the necessary resources and ability to deliver? Early August, it had announced Akitek Jururancang Malaysia Sdn Bhd and US-based Machado Silvetti & Associates as its master planners, chosen for a "highly functioning, interesting, innovative, and aesthetically pleasing urban district that will establish KLIFD as a financial centre of choice". A few weeks ago, it followed with 11 more appointments consisting international and local outfits in various fields of expertise, from infrastructure engineer to traffic experts to sustainability consultant. This is quite a pleasant change, and redeemed 1MDB from some of its detractors' criticism of being unable to make decisions. 1MDB reiterated that its selection process adopted best global practices, including at pre-qualification and request for proposals (RFP) stages. 1MDB also said it had engaged all potential vendors in numerous discussions to ensure all parties are able to work together to realise its vision for KLIFD. The need for keeping information close to the heart of the matter is, of course, understandable for fearing it will jeopardise negotiations and project's progress. However, 1MDB should still be aware of the public's curiosity and allow certain details to be available on a regular basis. For one, this action will keep speculations to a minimum and at the same time it enables the public to make up their mind better on whether KLIFD is indeed a beneficial project or otherwise. KLIFD is currently in its master planning phase, with a detailed plan set to be delivered early next year. Construction is scheduled to start in June next year. According to news reports, the first phase of the development is expected to be operational by 2016, when the first line of Malaysia's mass rapid transit system is set to be up and running. When fully complete, KLIFD aims to bring together leading financial institutions and top companies from all over the world into one place. With Malaysia's edge in Islamic finance as well as the country's location in Asia, it should well attract major players, complementing other financial centres in the region. If the project is indeed going to be one of the main drivers of the economy, the public would want to know what kind of animal it would be, or how the project could boost the surrounding areas with incentives to complement KLIFD. 1MDB perhaps is ready to shift gears. It should continue with its initiative to be more forthcoming, and assume the spotlight it has always been put under. Besides KLIFD, 1MDB is also the master developer for Bandar Malaysia, the urban redevelopment project where the old Sungai Besi airport is located. It has said that the selection of consultants for Bandar Malaysia, as the project is named, will undergo the same rigorous selection process with a mix of international and local companies. That should be a good thing. KUALA LUMPUR: Sunway REIT Management Sdn Bhd said that its unit SunREIT Capital Bhd had received the Securities Commission’s approval to establish a RM3bil medium-term notes (MTN) programme. SunREIT Capital is a special-purpose vehicle formed specifically for the issuance of the MTNs under the programme whose shares are held by OSK Trustees Bhd on behalf of Sunway Real Estate Investment Trust (SunREIT). SunREIT Capital is the wholly owned subsidiary of SUNREIT, which in turn is managed by Sunway REIT Management. HSBC Bank Malaysia Bhd, Maybank Investment Bank Bhd and RHB Investment Bank Bhd are the joint principal advisers and joint lead arrangers for the programme. The first issue of the programme shall entail RM1.56bil MTNs in nominal value comprising of a few classes. The programme has an expected tenure of up to 18 years and a legal tenure of up to 20 years. The proceeds of the MTNs shall be utilised for the purpose of advancing to SunREIT where the REIT Trustee shall utilise such proceeds for financing (including repayment of cash used by SunREIT to part finance) the investment activities of SunREIT or refinancing of its existing and future borrowings for investment activities. The proceeds will also be used for working capital requirements of SunREIT and to defray expenses incurred in relation to the MTN programme as well as to refinance maturing MTNs on their respective maturity dates.